The P.R.E. — Origin P.R.E. The P.R.E. or Pura Raza Española, roughly translates to Pure Spanish Horse. You have seen them in movies and probably didn't even know what they were; just that they were the most beautiful horses you have ever seen. They have long flowing manes and tails, come in all colors but are mostly gray or white, and have been bred for centuries to bond with, understand and relate to humans with timeless generosity and nobility. They were the horses that were reserved for use by kings, queens, and elite government officials to make them look impressive and important. When you ride one you immediately get the sensation that you are royalty while their smooth regular gaits remind you of sitting on your favorite couch. In fact they are so special you should not look at them for very long without the protection of sunglasses! They look like a dream, they ride like a dream, they act like a dream and you will never want to wake up. Just being near them is a thrill. (OK, now you understand how much we really love these horses). P.R.E. Horses are registered in the Spanish Stud Book in Spain, which will provide a carta (passport) insuring the horses' lineage and authenticity as documentation of the horse's registration. A P.R.E. horse has to pass a physical inspection and genetic testing when it is a foal to receive its carta. This process is called Inscription and is usually done when the foal is still nursing from its dam. When the horse reaches adulthood, a minimum of three years old, it is examined again for minimum size, quality, transmissible faults and breed fidelity. When it passes this approval it is said to be revised, or approved for breeding or reproduction purposes. The heritage of the Pura Raza Española (P.R.E.) contains an abundance of tradition and culture. Its time honored elegance and harmony have demonstrated its competence and achievement. The Pure Spanish Horse - Strong, Agile, Beautiful, Noble in appearance and character yet docile, easily trained and ridden is the horse we honor today, tomorrow and always. The Pura Raza Española (P.R.E.) has been linked with the history and the culture of Andalusia since time immemorial. There are cave drawings dating back to 5,000 BC found in the caves of Altamira and Canforos de Penarubia in northeastern Spain depicting native horses whose body types are remarkably like today's horse. These drawings depict the predecessors of the Pure Spanish Horse. Originally used in warfare, as a means of transport and for other work, the industrial revolution changed his role to that of man's companion in sport and leisure activities, in which he is one of the leaders in the Andalusian region. The Pure Spanish Horse has been an integral part of Spain from its beginnings and contributes much to our better knowledge and understanding of its landscape, customs and people. The Pure Spanish Horse was unified as a breed in the sixteenth century (between 1567 and 1593) by the Spanish King Felipe II who formally established the standards for the breed which we recognize today as the Pure Spanish Horse. During these years King Felipe II decided to bring to life the universally idealized horse which has been so long pictured in history, in bronze, in paintings. He looked at the basic horse bred in Spain, selected the best of those examples which came closest to the idealized animal he desired, and directed that the idealized horse be produced. Concurrent with his breeding program, the humanistic approach was spreading through Spain and the teachings of the ancient Greek Xenophon were put into practice for the treatment and training of these carefully bred horses. While the historical use of the Pure Spanish Horse in Spain was first as a farm horse to work with the brave bulls destined for the bull rings, it was also the horse which carried its lords into battle and equally proudly carried them in their moments of triumph as a parade horse. The Pure Spanish Horse is still used in Spain to fight in the bull ring and still used to work stock on the farms, and of course, is considered one of the national treasures of Spain, an inheritance handed from father to son through generations. The horse is used in dressage competitions, in competitive driving as single horse or four-horse hitch, and in the discipline distinctly Spanish, the Doma Vaquera - formalized as the show ring version of farm work, most closely related to a reining pattern with combined dressage elements. In the USA, we don't have bull fights, but the Pure Spanish Horse has been found to be adept at all the disciplines one would expect: dressage, hunt seat, saddle seat, western pleasure, parades, trail, and certain of our horses even excel as open jumpers. Their conformation hints at their capabilities: strong boned legs, good slope to the shoulder, deep heart-girth, round powerful haunches. The classically beautiful head of a Pure Spanish Horse is unique and an instant identifier of its breed. One can read the history in their large oval eyes inside a triangular-shaped orbital arch and can imagine strength for extended efforts in the inverted comma-shaped nostrils which expand downward to bring in large quantities of air. And of course there are the unique racial characteristics in the shape and dexterity of the upper lip, the sensitivity of the mouth and the point of the chin. In Andalusia, where most of the Pure Spanish Horses are bred, the Pura Raza Española horse predominates. It is the heir of the Cartujano horse, which attracted the admiration of Kings and became the preferred mount of Royalty and the Cavalry. This horse made its second official appearance in the USA in the late 1960s (the first having been in the cargo holds of the voyages of the Conquistadores beginning with second voyage of Christopher Columbus). The process of importation was difficult and costly; the population grew slowly to the numbers we have today in the USA. The Pura Raza Española (P.R.E) has a singular and unquestionable beauty marked by large eyes that express a great vivacity. The characteristic feature of its beauty, however, is its thick mane which endows it with a unique elegance. The most outstanding attribute of the Pure Spanish Horse is, without any doubt, its temperament for even though it is certainly a very docile animal, and easily handled, not only when it is in training but also in its rest periods, at the same time it displays a vigorous and sedate character with an excellent capacity for obedience. All this, together with its beauty, makes it an ideal horse for riding, which is why it is in so much demand as a "horse of pleasure". In 2002, the Pura Raza Española (P.R.E.) 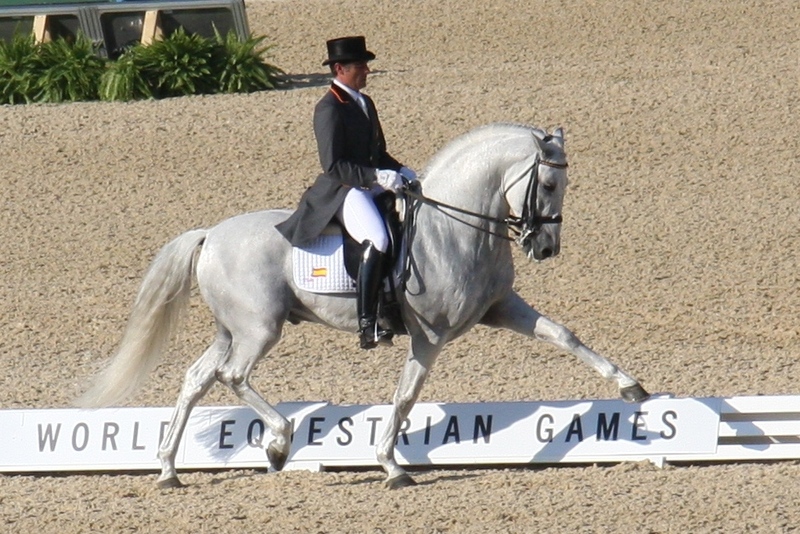 horse's potential in competitive dressage was secured when the Spanish team, including two (2) P.R.E. mounts, scored the silver medal. Success on this scale calls for celebration. In between and since these milestones, the P.R.E..'s popularity has escalated. In 2010, the PRE Fuego de Cardenas (Fuego XII) and rider Juan Manuel Muñoz Díaz were 5th in the world at Grand Prix & GP Freestyle, and 4th in the world in the Grand Prix Special. Another PRE, Norte and rider José Antonio Garcia Mena also held their own in the final standings. 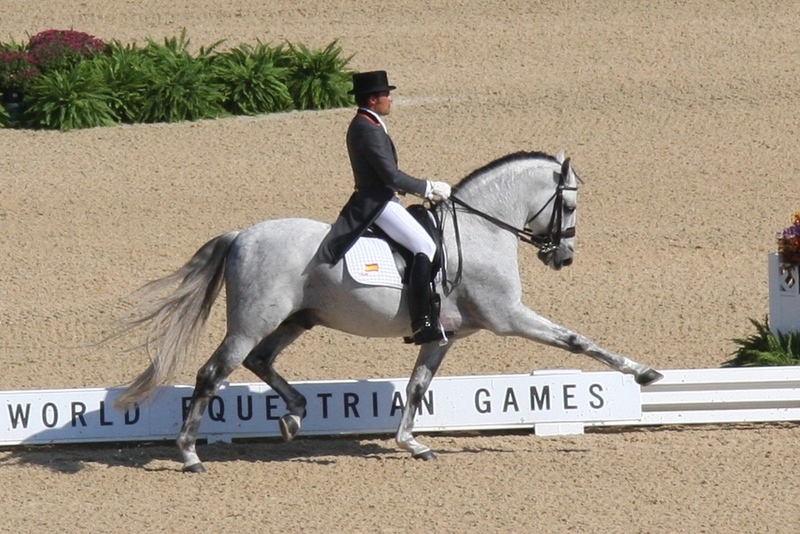 Muñoz Díaz and Fuego came back and competed at the 2012 Olympic Games in London, UK. Demand from the international and American dressage communities is growing exponentially. There is equal zeal for this breed from equestrians whose only ambition is to have a great horse to ride and enjoy. Thanks to its athletic ability, even temperament, sturdy yet refined conformation and remarkable beauty, the Pura Raza Española fulfills many dreams. This breed, which enjoys a great prestige already, each year, acquires a greater number of admirers throughout the world in Spain and in Europe in general: people who defend and support the growing recognition of this beautiful and noble beast which is our Pura Raza Española (P.R.E). Perhaps the best quality of the Pure Spanish Horse is the willingness to work with his less than perfect human companion - the nobility and grace with which he participates joyfully in anything requested by his rider. From the drawings in the caves where early man was shown leading the prototype Spanish horse to today, the Pure Spanish Horse has been known and respected for its submission to the aids and the assistance he offers his weekend rider. The Pure Spanish Horse is truly a horse which can offer its best qualities to his rider.